Schematic of the experimental setup. Six YIG/Pt nanowires (in red) integrated in the signal arm (S) are measured in parallel. A bias-T is utilized for simultaneous RF transmission and DC voltage detection by lock-in techniques. Credit: Jungfleisch et al., Nano Lett., 17, 8 (2017). Computers process and transfer data through electrical currents passing through tiny circuits and wires. As these currents meet with resistance, they create heat that can undermine the efficiency and even the safety of these devices. To minimize heat loss and optimize performance for low-power technology, researchers are exploring other ways to process information that could be more energy-efficient. One approach that researchers at the U.S. Department of Energy's (DOE) Argonne National Laboratory are exploring involves manipulating the magnetic spin of electrons, a scientific field known as spintronics. "In spintronics, you can think of information as a magnet pointing one way and another magnet pointing in the opposite direction," said Argonne materials scientist Axel Hoffman. "We're interested in how we can use magnetic excitation in applications because processing information this way expends less energy than carrying information through an electrical charge." In a report published in Nano Letters, Hoffman and fellow researchers reveal new insights into the properties of a magnetic insulator that is a candidate for low-power device applications; their insights form early stepping-stones towards developing high-speed, low-power electronics that use electron spin rather than charge to carry information. The material they studied, yttrium iron garnet (YIG), is a magnetic insulator that generates and transmits spin current efficiently and dissipates little energy. Because of its low dissipation, YIG has been used in microwave and radar technologies, but recent discoveries of spintronic effects associated with YIG have prompted researchers to explore potential spintronic applications. In their report, Argonne researchers characterize the spin dynamics associated with a small-scale sample of YIG when that material is exposed to an electrical current. "This is the first time for anyone to have measured spin dynamics on a sample size this small," said Benjamin Jungfleisch, an Argonne postdoctoral appointee and lead author of the report. "Understanding the behavior at a small size is crucial because these materials need to be small to ever have the potential to be successfully integrated in low-power devices." Researchers attached the YIG sample to platinum nanowires using electric beam lithography, creating a micrometer-size YIG/platinum structure. They then sent an electrical current through the platinum to excite the YIG and drive spin dynamics. They then took electrical measurements to characterize the magnetization dynamics and measure how these dynamics changed by shrinking the YIG. "When shrinking materials, they can behave in different ways, ways that could present a roadblock to identifying and actualizing potential new applications," Hoffman said. 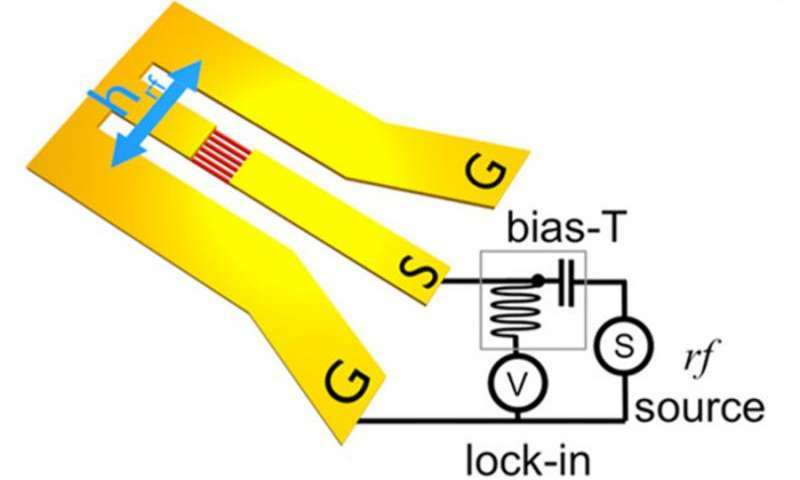 "What we've observed is that, although there are small details that change when YIG is made smaller, there doesn't appear to be a fundamental roadblock that prevents us from using the physical approaches we use for small electrical devices." The report, titled "Insulating Nanomagnets Driven by Spin Torque," is published in Nano Letters.